Dr. Larry Giebel founded Quince Orchard Veterinary Hospital in 1980. It was first located in the shopping Center behind McDonald's’ at the corner of Quince Orchard Road and Darnestown Road. He built the current Hospital in 1990 just a quarter mile East on Darnestown Road. Dr. Giebel’s wife Marilee and all three of his daughters have always been very involved in the hospital. Marilee handling all the planning and behind the scenes management and the girls “helping” as soon as they could walk! All three of the girls have become Veterinarians. Dr. Megan and Dr. Lauren Giebel currently practice at this hospital while Dr. Erin Giebel is a Veterinarian at Savannah Veterinary Hospital in Lewes Delaware. ​The Giebels have tried to make this a real family and community hospital. Many of our "Pet Families" have been with us for all 35 years including several generations of pets as well as several generations of humans! Dr. Larry Giebel received his Doctor of Veterinary Medicine (DVM) from The Ohio State University College of Veterinary Medicine. On any given Saturday you will find him cheering for his Buckeyes! Dr. Douglas Amspaugh received his Bachelor of Science degree in Zoology from the University of Maryland, College Park and his Doctor of Veterinary Medicine degree from Virginia-Maryland Regional College of Medicine in 2000. He is a native of Rockville, Maryland and spent a year in Africa as a volunteer working with cheetahs. 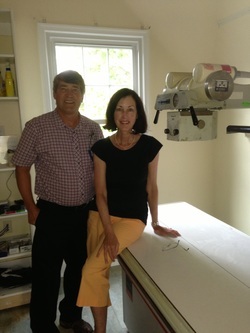 Dr. Amspaugh joined Quince Orchard Veterinary Hospital in 2004. He enjoys the variety in veterinary medicine, from wellness visits to complex internal medicine cases, and from new puppy and kitten visits to caring for our oldest patients. His interests include gardening, watching movies, and spending time with his two cats. On Saturdays, he is cheering for the Terrapins and the Hokies! ﻿﻿Dr. Matthew Felrice is a 2003 graduate of Virginia-Maryland Regional College of Veterinary Medicine. He attended Northwestern University in Evanston, IL and graduated with honors in 1998 with a degree in Neurobiology. He grew up in Montgomery Village and went to Watkins Mill High School. Dr. Felrice joined QOVH as an associate veterinarian in 2005. His veterinary interests include medicine and surgery with dogs, cats, small mammals, bird and reptiles. Other areas of specialty include dentistry and ultrasound. Medicine. Dr. Megan attended Virginia Polytechnic University in Blacksburg Virginia and graduated with a Bachelor of Science in Psychology in 2001. Dr. Megan than extended her education doing a surgical internship and rotating internship at Veterinary Referral Associates in Gaithersburg, MD. 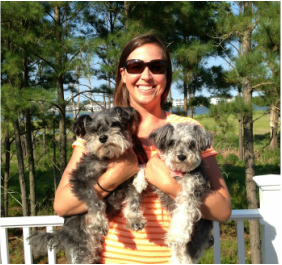 Dr. Megan Giebel enjoys living in the Lakelands with her two dogs and all of their furry friends and neighbors. Dr. Lauren Giebel graduated from The Pennsylvania State University with a degree in Animal Science in 2007. She followed her father and two sisters into the veterinary profession, graduating from the Virginia- Maryland Regional College of Veterinary Medicine in 2011. Dr. Lauren Giebel then completed a one year focused internship in Emergency and Critical Care with Animal Emergency and Critical Care at TheLifeCentre in Leesburg, VA. Following that, she completed a Surgical Internship with Veterinary Surgical Centers, VA where she gained valuable surgical experience. Dr. Lauren Giebel spent the past two and half years working in general practice in Virginia Beach and Yorktown Virginia. Dr. Lauren Giebel’s interests include emergency and critical care, surgery, working dogs, and geriatric care. Our veterinarians routinely consult with and refer complex cases to veterinary specialists. We can accommodate onsite specialty consultations with traveling board certified veterinarians in Radiology, Internal Medicine, and Surgery or refer you to local specialty hospital depending on your pets needs. We are fortunate to have many outstanding specialists in the DC Metropolitan area providing specialty care in fields including: behavior, cardiology, dentistry, dermatology, exotics, internal medicine, surgery (soft tissue and orthopedic), oncology, ophthalmology, and advanced imaging (MRI, CT).